The record is made up of Codex A collection of pages, usually gathered into quires, and bound between covers. ; ff. ii+292+ii. It was created in 10 Muḥarram 773. It was written in Arabic. The original is part of the British Library: Oriental Manuscripts. A Mamluk manual on horsemanship, military arts and technology by Muḥammad ibn ‘Īsá ibn Ismā‘īl al-Ḥanafī al-Aqṣarā’ī (محمد بن عيسى بن إسماعيل الحنفي الأقصرائي ; d. 1348, Damascus). The manuscript was completed on 10 Muḥarram 773 (25 July 1371) by the scribe Aḥmad ibn ‘Umar ibn Aḥmad al-Miṣrī (see colophon Section at the end of a manuscript text. on f. 292r, transcribed below). 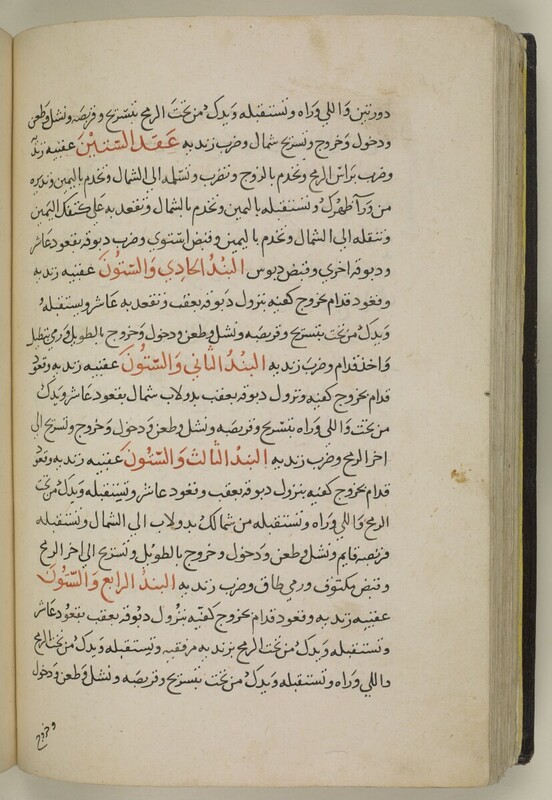 The text includes a number of extracts from other works including a treatise on sword making by the philosopher Kindī and addressed to the Caliph al-Mu‘taṣim (باب في السيوف أنواعها وسقاياتها رسالة أبي إسحق الكندي للمعتصم أمير المؤمنين ; f. 144r ff.). The manuscript contains eighteen coloured paintings and 25 diagrams. (f. 140r) صورة أربع فوارس مع كل واحد منهم سيف ودرقة وكل منهم درقته على كفل فرسه ('Illustration of four horsemen, each one with a sword and a hide shield, and each one carrying his shield on his horse's croup'). (ff. 225v, 226r and 227r) Three sketches of Euclidean figures (أشكال أقليدس; f. 225, line 17) used by the ancient Greeks as military insignia.